Summertime…what does it bring to your mind? You might be thinking of beautiful weather, cloudless skies, taking long hikes, the beach, and drinking cold beverages as the hot sun beats down upon you. The summer is also a time for many to go on vacations, go to camps, and spend a lot less time at home. With Memorial Day starting off the summer, July Fourth breaking it up, and Labor Day ending it, there are a lot of chances to get out of town. Sometimes, due to the simple fact that you enjoy spending more time outside of the house, the interior and the exterior of your residence begins to suffer. With you and your family bustling off to barbecues, trying new restaurants, and spending a week or two on vacation, you don’t have the energy or the desire to clean. We understand, which is why our window washing company is able to take a load off your shoulders and step in with our services. 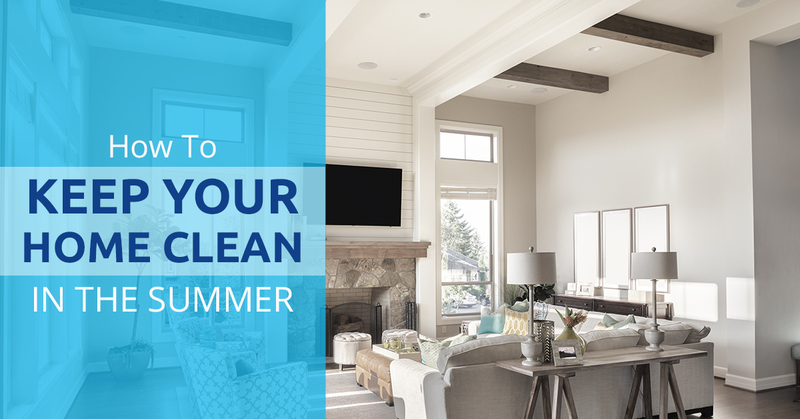 If you’re looking for ways to keep your home clean in summer, then today’s blog from our window washing company will help give you some insight on how to keep your home looking clean and sparkly during the hottest months of the year. These three tips to help you keep your home clean during the second part of summer will allow you to arrive home from vacations or other fun activities feeling great about a beautiful tidy home. We know that spring cleaning was only a few months ago, but by maintaining an immaculate residence during the summer will allow you to feel wonderful coming home after some time away as well as being able to spend more time outside and doing activities you enjoy because you don’t have to focus on other things. For more information on our window washing company and to help keep you doing the things you love, take the time to contact us. Don’t you just hate when creepy crawlies come into your home? It can be a distressing feeling to find a spider the size of your fist making its way into your kitchen or locating a bee hive in the corner of your living room. The first step to keeping pests out of your home is having a screen on your door and your windows. As the weather gets warmer and the nights cool down, you probably want to keep the doors and windows open to air out the house. It’s understandable and a great way to save on energy. However, are your screens as sturdy as you think they are? Are there small holes in them or rips from where your kids accidentally tore them? Early spring is the best time to repair your screens since you will be opening the doors and windows a lot more; however, since the summer is halfway over there have probably been some damaged sustained to the areas. By checking over your screens, you’ll be able to keep out those creepy crawlies and ensure that your home only has you and your family as tenants not an infestation of intruding pests. Our window washing business strives to make sure each of your panes shine. Our residential window washing services will provide a safe and immaculate environment in your home. During the summer months, having clean windows allows you to look out to your back- or front yard with ease. You don’t have to worry about having dirty or debris filled windows when we come to your home consistently to ensure they are sparkling. It’s important to clean windows in the summer because if you don’t clean your windows, then you could be damaging, staining, or weakening them. By regularly cleaning your windows, you won’t have to worry about them breaking or having difficulties in seeing outside. We’ll wipe down the sills, scrub the panes, and even fix any repairs that need to be done to ensure no air is escaping and no pests are making their way inside to your residence. Power washing is so important to clean the debris, grit, and any stray dirt on your home. We can power wash decks and other objects to remove any of the grime and mud that may have found its way to damage your property. You might not think power washing will make a difference in your home or that you don’t need it, but our window washing service will determine what needs to be washed away due to being dirty and gritty. It’s important to do power washing in the summer, especially toward the end, because you’ll remove all of the grit that’s caked its way on your deck. Power washing in the summer will reach every square inch of your deck, driveway, or walkway without anything getting missed. At ProClean Windows, we can help you with each of these cleaning summer tips. Our window washing company focuses on cleaning the interior and exterior panes in your home, but we also offer a lot more. For further details on our power washing, screen repair, and cleaning, as well as gutter cleaning, contact us at (801) 553-6481.